CONFOR featured heavily in a prime-time TV feature which showcased the benefits of productive forestry to more than 4 million viewers. Chief Executive Stuart Goodall was the main contributor to a piece on early-evening BBC magazine programme The One Show. Watch the link here (from 2 minutes, 40 seconds). 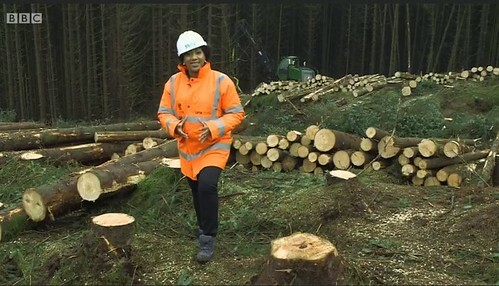 One Show presenter Trish Adudu visited a forest and a sawmill and discussed the value of forestry and timber to the UK economy - a direct contribution of more than £2 billion and more than 40,000 jobs supported. Stuart showed Trish how sawmills have invested in modern technology to ensure that every part of a tree is utilised to make products that people use in their everyday lives, right down to the wrappers for their sandwiches. Andrew Vaughan of Tilhill also joined Stuart to discuss the need for more planting to ensure that sawmills and other businesses are not competing for a declining timber supply in the coming decades. Andrew also highlighted the disproportionate increase in regulation which is having a significant negative impact on new planting. The programme also noted that the UK's forest cover, at around 13 per cent, is less than half the global average - and that we still import 80 per cent of our timber. Stuart made the case for enhancing productive woodland to ensure that rural jobs and growth are not lost in years to come - and helped to plant The One Show's own woodland, with Trish wondering whether the programme would still be on air in 35-40 years when the trees reach maturity and are harvested! Stuart Goodall said: "This was a tremendous showcase for the commercial forestry and sawmilling sector. Trish Adudu loved being in the forest and appreciated both its beauty and its economic importance. It was great to see a presenter taking time to understand the long-term nature of forestry, the value of the timber it produces - and that fact that forests can be attractive and productive at the same time." The programme was filmed in Westwater forest, Dumfries & Galloway, and at the James Jones & Sons sawmill in Lockerbie. Confor would like to thank Tilhill and James Jones & Sons for making the filming possible.